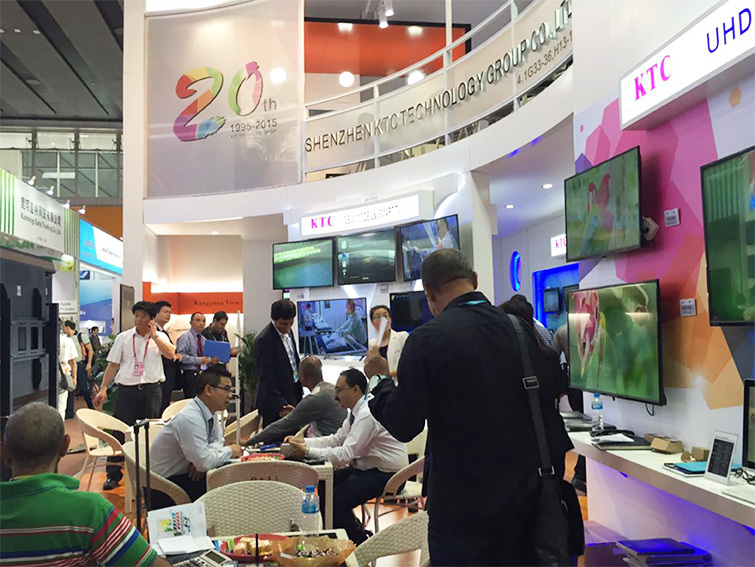 April 15-19, 2015, the Spring Canton Fair was held as scheduled in Zhuhai District of Guangzhou in Pazhou International Exhibition Center, our Marketing Department brought our new products, the L81 series LED TV and tablet PCs to the exhibition and come back with fruitful results. Our boot design expressed the honored mission of “to improve lives with technology”, booth design was enriched, our company name and logo are beautiful clear, a “good luck fish pond “set up in product exhibition center ,let customers enjoy life white visiting technical products. We focused on showing our L81 new series of LED TV products and the mainstream 10-inch and 8-inch tablet PC with stylish, superior performance, high-end configuration, gathering highlights, and attracted old and new customers for cooperation. This exhibition, based on showing our perfect technical strength we are standing at a new starting point to explore the market trend, combined with the demands from new and old customers technical advice and our own advantages, continue to increase research and development, and enhance brand influence further with innovative products to meet customer needs and dedication to the community.